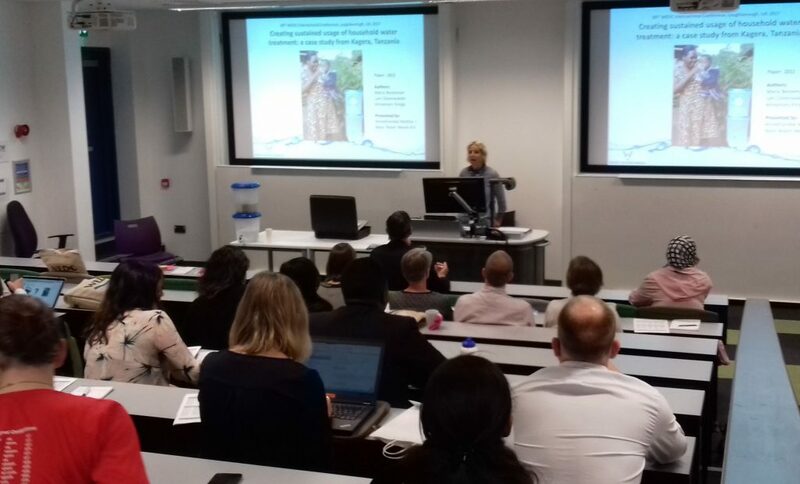 During the WEDC conference we presented our case study from Kagera, Tanzania at the Loughborough University in the UK. This study is about the results so far of our ‘Safe Water for coffee farmers in Tanzania’ project, which project has exceeded expectations. In this project we cooperate with the Tanzanian NGO KADERES, who developed a safe drinking water project in the Kagera region in Tanzania. The focus of the project is on sustained usage of household water treatment products. As project partners we decided not to invest in the products, but in the creation of sustainable supply chain for a household water filter. This means that we sell filters through local retailers and we ask end-users to invest the expected commercial retail price. By the end of 2016 an analysis of all monitoring data showed the percentage of households still using the household water treatment product exceeded expectations. 93,1% of households owning the product between 0-1 year were still using the product and 82,7% was still using it after 1-2 years. It seems probable that the project set up has influenced the high usage rates. We continue to work with great enthusiasm on this project and are very excited about the future.